Picture Perfect Port Perry Waterfront Home! At a loss for Words on this one !! but I will try to capture just how beautiful this home is! No need to have a cottage and a home when this property is available to you. Absolutely Stunning from the moment you walk in to the moment your eyes take in the breathtaking vistas and views on 1 of the 2 huge decks or the amazing amour stone patios. Main Floor also has direct access to the 2 car garage, Huge Foyer with Double Closet and Beautiful curved staircase leading to the 4 Bedrooms on the Second Level. The second Floor is Home to 4 Large Bedrooms and the Main 4 Piece Bathroom. The Master Bedroom extends across the entire back of the home and has fantastic views across the the lake from that can be enjoyed from the sitting area, the full length covered deck or from the soaker tub in the ensuite. The Master Ensuite is equally impressive with a Stunning glass shower His and hers sinks a water closet and free standing soaker tub. This Ensuite could rival any luxury hotel. The absolutely massive walk in closet is set perfectly within the Ensuite and provides perfect organization. You simply must see this Master Retreat! The basement is just that, set up for a place to enjoy time with the guys, gals or relax with some family time. The Basement can hardly be called a basement as this beautifully styled area of the home just happens to be the lowest level, but does not disappoint from a stylish and function perspective. Enjoy a movie, Play some Billiards or workout in the gym area or walk outside and enjoy the view from one of 3 patio areas built into the hillside out of stunning armour stone. The yard has been completely landscaped and shaped with armour stone from Front to back no spot has been left untouched. This home has a Boat lift and dock. Enjoy warm Summer days out on the water fishing or an exhilarating day of tubing or wake boarding. Lake Scugog is connected to the Trent Severn waterway so your travels can take you all the way to LakeOntario or Georgian Bay. Do Not Miss this Opportunity to make this stunning retreat your Own! Contact me today for more details or to book your very own private showing – be sure to leave plenty of time as once you arrive you may not want to ever leave again ! Are You Searching For A Cottage? If you are searching for an affordable Cottage or Waterfront Lifestyle, now is the time to get going. More and more Waterfront properties are hitting the market and providing more options for Buyers. One Area to look is around Port Perry, Seagrave, Little Britain and Lindsay. These areas are close to Toronto and provide less traffic than some of the more popular cottage destinations. The 407 Extension will provide more travel options and make for more time at the cottage and less time in the car. Take For Example a new listing just outside of Port Perry that provides a western exposure for Beautiful sunsets, shallow water access and an entrance to the Trent Severn Waterway. Property is listed for just over $300,000 and can be used as a residence or cottage. Lake Scugog provides for great fishing both winter and summer and you are only 40 mins north of Whitby or Oshawa and 1.5 Hours east of Toronto. I have the area knowledge as my family and I currently live in Port Perry and own a Waterfront property. I can carefully guide you through the process of acquiring a second property or help you create a lifestyle that allows to achieve both a home and cottage combined into 1. I will put you in touch with Lenders, Home Inspectors and Real Estate Lawyers that will help you through the process. If you are looking for a Cottage Property or Waterfront Lifestyle please give me a call and we can start preparing and outlining your needs and exactly what you are looking for and you can start enjoying the cottage life before the end of this summer. Wonderful Waterfront Bungalow – For Sale! Stunning Views, Gorgeous Sunsets and a Year Round Home and Cottage all in One!! Don’t miss this opportunity to have your very own year round retreat. This wonderful home is a mere 15 Minutes to Downtown Port Perry and all the amenities this Historic town has to offer and is located about an Hour outside of Toronto’s East End . This Home has had many renovation and updates over the years including a brand new fully Renovated Kitchen, 2 Updated Bathrooms, Hardwood Floors throughout the main level. Huge Savings & Fantastic Opportunity ! Waterfront living at it’s finest! Fabulous, maturely treed and landscaped half acre lot with 90 feet of western shoreline on one of the most prestigious streets around Lake Scugog. 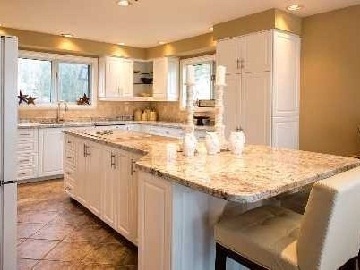 This is a sprawling custom built bungalow with beautiful and fully finished walk out basement. There is also a detached 6 bay garage set away from the house and nestled among the trees. Spectacular water views are captured from almost every room and multiple walk outs lead out to a massive Trex deck with glass railing overlook the private waterfront lot complete with heated salt water in-ground pool, large stone fire pit, play centre and tiered waterside deck leading to 2 docks. Inside this home are extravagant upgrades, a newly renovated gourmet kitchen with built-in appliances and extensive granite counter tops invites the chef of the family to entertain in style! Pot and pan drawers, pantry, tumbled marble back-splash and breakfast bar area add to the desirable work space. A huge dining area walks out to the Trex deck overlooking sunsets on Lake Scugog! Other luxurious finishings include gleaming hardwood floors, ceramic and polished limestone floors, renovated, spa-styled baths, and dynamic architectural elements. The great room features a cathedral ceiling, reclaimed brick wood burning fireplace, hardwood floors and giant picture windows looking out over the water. The master bedroom suite offers hardwood floors, California shutters, crown moulding, sliding glass walk out to the deck, a huge custom designed walk in closet and sumptuous 4pc bath with glass tile, polished limestone, giant glass walled shower with rainfall shower, granite counters, double sinks and generous cabinetry. 2 other main floor bedrooms feature hardwood floors and double closets and are serviced by a renovated 4pc bath with ceramics and granite. The main floor laundry is generously sized with double closet, ceramic floors and side door walk out. Downstairs, a newly remodeled entertainment area is replete with fabulous custom oak bar with exotic granite counters, glass cabinets and lots of cupboards. The rec room offers a wall to wall reclaimed brick setting for the wood stove, huge picture windows overlooking the yard, pool and water, and a sliding glass walk out to an extensive interlocking brick patio. A propane gas fireplace trimmed in granite adds coziness to the games room. Both the games and rec rooms offer pot lighting and knock down ceilings and full audio system. A 4th bedroom with double closet, a third renovated 4pc bath with ceramics and granite, an office with double closets, a drive-in workshop, cold cellar and furnace room round out the lower level. Other features and upgrades completed since 2003 include: Shingles, eaves-troughs, security system, propane furnace, central air conditioning, rebuilt stone chimney, metal liner and fireplace insert and wood stove, propane fireplace, 16×32 pool and heater, stone fire pit, all decks, both sheds, all flooring, garage addition. Inclusions: all electric light fixtures and ceiling fans, all window blinds, 2 fridges, built-in appliances, washer, dryer, central vac, security system, 3 garage door openers, all pool equipment, 2 sun umbrellas, gazebo. 21 Drew Street, Oshawa ON.